An inquest jury has criticised the British Army over the 1996 killing of Derryman Dermot McShane. The 35-year-old man. 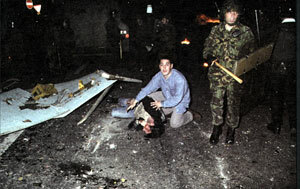 from the Brandywell area of the city was crushed when a British Army Saxon armoured vehicle rammed a barricade during rioting which erupted in the city in July 1996 after an Orange parade was forced down the Garvaghy Road in Portadown. It emerged during the hearing that the driver of the Saxon, Private Daniel Moran, ignored a request from the coroner to attend the inquest and give evidence. According to the inquest jury, the armoured vehicle was driven “inappropriately” through hoarding that was being used as a barricade in the William Street/Little James Street area of Derry in the early hours of 13 July 1996. Dermot McShane was standing behind the hoarding when the Saxon armoured vehicle advanced without warning and “punched through” the barricade, crushing him. He died later in the city’s Altnagelvin Hospital. The jury found that on the night of the rioting in Derry there was confusion and a breakdown in communication between the RUC and the British Army and that the RUC was giving direct orders to the British Army, including issuing an order for the heavy-armoured personnel carrier to advance. The jury said that no warning was given as the vehicle advanced and “the barrier was punched through rather than pushed through”. The jury’s findings also declared that the RUC order to Moran, who was driving the vehicle, did not follow procedure. “[The Saxon] should not have advanced until the direct order was received from the military commander. During the three-week inquest at Derry Courthouse it was disclosed that the crown forces fired up to 1,000 plastic bullets.